Haaretz senior editor Steven Klein said past Israeli leadership has looked to Jews in the Diaspora mainly as a source of aliya, but attitudes are changing. While the American-Jewish community is largely supportive of Israel, there is also disagreement with some of Israel’s actions in the religious and political spheres. Dr. Steven J. Klein, senior editor of the English edition of the Israeli newspaper Haaretz, explored several of the complexities of the American-Jewish relationship with Israel at Anshe Emeth Memorial Temple in New Brunswick for the annual Syril and Dr. Norman Reitman Scholar-in-Residence Weekend on Oct. 22 and 23. Klein, a North Carolina native who lives in Israel, said that for most of Israel’s history, the government’s interactions with people living in the Diaspora were singularly focused on increasing aliya, while ignoring their concerns about Israeli policies — domestic or foreign. The Israeli ambivalence toward Jews living outside Israel can be traced to its first prime minister, David Ben-Gurion, who believed, Klein said, that “the Diaspora was doomed and anti-Semitism would never go away.” This viewpoint molded the attitudes of future Israeli leaders, whose only interest in world Jewry was as a source of future immigrants. Such an attitude was particularly potent last year, Klein said, following the wave of anti-Semitic incidents perpetrated by radical Islamists in France, which prompted 7,000 French Jews to make aliya last year, the largest source of new olim in 2015. But, Klein said, there was resentment against Israel among the Jews of France, who felt that the Israeli government’s attention to the community had less to do with genuine concern than with an opportunity to encourage them to make aliya. “There was a feeling of being patronized, that there was a lack of sensitivity on the Israeli side,” said Klein. 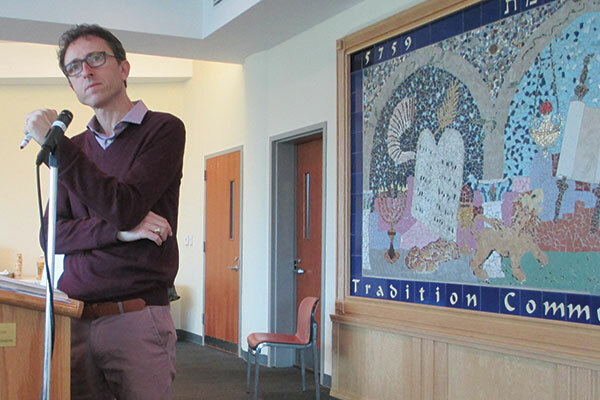 During one of the weekend’s session on how to support a “flawed” Israel, members engaged in a lively discussion often centering on issues Reform Jews (Anshe Emeth is a Reform congregation) have with Orthodox control of religious matters. Focal points included the fight with Orthodox authorities in recent years by women who want to pray at the Western Wall with a Torah and the controversy surrounding the acceptance of non-Orthodox conversions. Although the early Zionists and state founders were secular, Klein said, they were raised Orthodox and believed it to be the only “authentic Judaism.” They viewed the Reform and Conservative movements “as products of the Diaspora and so made Orthodoxy the official religion, and it became institutionalized.” However, he noted, Ben-Gurion believed Orthodoxy would eventually die out as Israeli society evolved and became more inclusive. Even if the government’s attitude toward world Jewry hasn’t shifted substantially since the days of Ben-Gurion, traditional views are changing among the Israeli public. Klein noted a recent survey that found that 71 percent of Israelis believe the influence of Diaspora Jews should be taken into consideration. Among those at Anshe Emeth, support for Israel was strong, although a number of the attendees were disturbed by what they perceive as second-class status on issues important to non-Orthodox Jews. 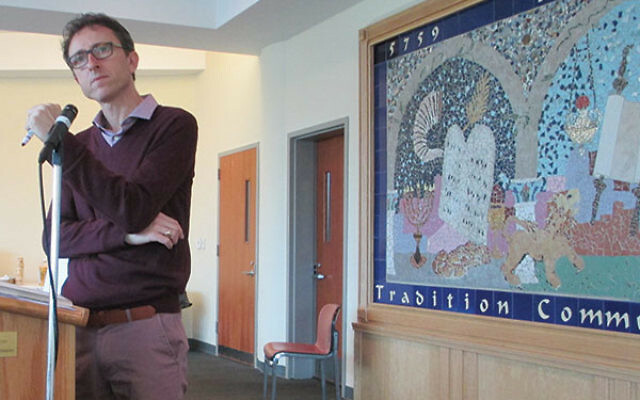 Dave Snyder of Kendall Park, who converted to Judaism under the direction of the synagogue’s senior religious leaders, Rabbi Bennett Miller, said he supports Israel despite not having a familial connection to the Jewish state. Klein said that for him “the watershed moment” in the relationship with the Diaspora came in 1982 after a massacre by the Lebanese Christian Phalangist militia at two Beirut-area refugee camps. Israel had allowed the Phalange to enter the camps as part of a plan to transfer authority to the Lebanese. Klein said that despite evolving Israeli attitudes, vestiges of the old thinking remain. He noted the historic Hurva Synagogue in Jerusalem’s Old City, which was seized by the Jordanians during the 1948 War of Independence and recaptured by Israel in the 1967 Six-Day War, had been left unrepaired as “a strong symbol of the Zionist movement.” It was visited by legions, including tour groups led by Klein, and in 2010 was rebuilt and opened as an Orthodox synagogue.